Have you heard of Lidl? Lidl is a chain that sells cheap and often peculiar food items, some of them can be surprisingly nice. When I was small my mum once bought a packet of not so authentic biscotti from Lidl. 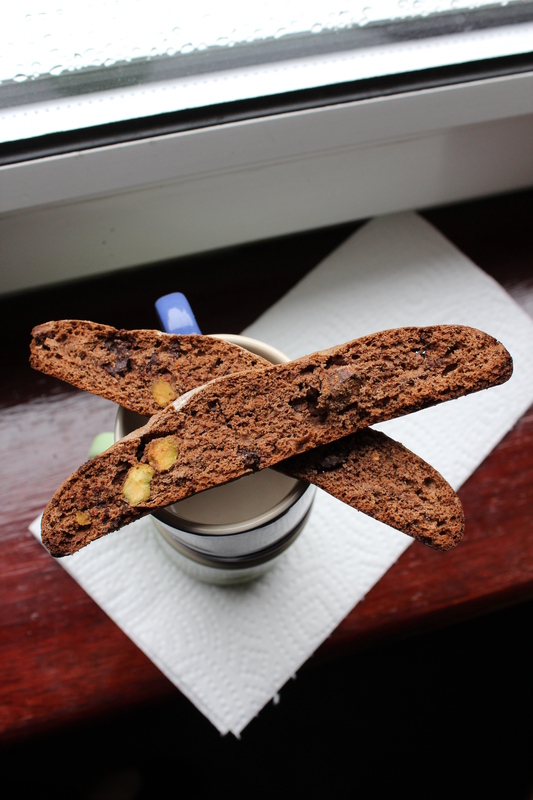 I tried one of these biscotti things and then I had to have another one, and then another one, until most of the contents was gone (I often did that sort of thing). 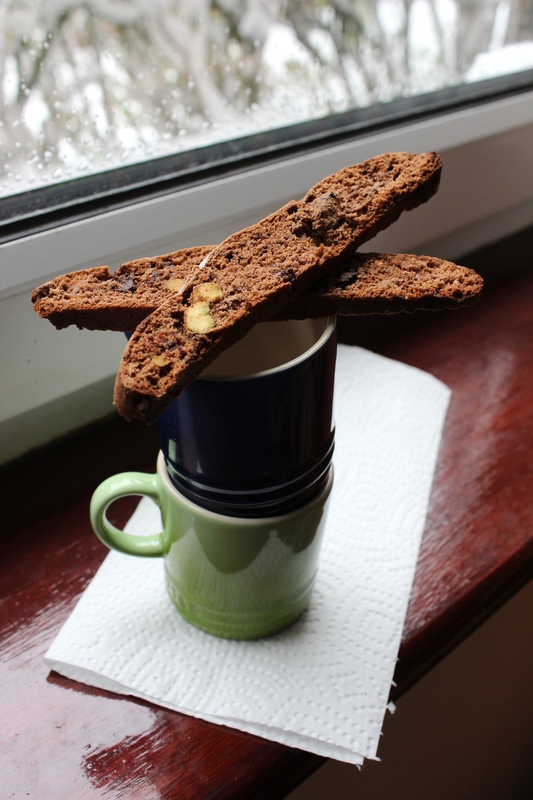 Biscotti can be extremely moreish, and this event of my childhood proves that they don’t even have to be of a high quality for you to want to eat another one, and another one… The biscotti that I made last night, however, are good quality and therefore even nicer. Biscotti are very dry. Keith’s mum asked me if they are supposed to be that dry, and they sure are so make sure you do what the Italians do and dunk them in a drink. I’m not a big fan of alcoholic drinks so I recommend that you do what according to Wikipedia isn’t traditional and dunk yours in a cup of hot chocolate or black tea with milk in it. These biscuits will last for a really long time because of the dry nature of them (twice baked bread actually used to be a staple food for the Roman legions according to Wikipedia). Put the oven on 190 degrees C/375 degrees F (165 degrees C/330 degrees F if you’re using a convection oven) and chop up the chocolate coarsely and roast the nuts in a frying pan. Whisk the eggs together with the sugar for a couple of minutes. Stir in the nuts and the chocolate. Mix the flour, the cocoa powder and the salt in a small bowl and add this to the wet mixture and stir to mix it all. Divide the dough into two on two sheets of greaseproof paper and careful pat it out into two flat logs, the dough is quite sticky. Bake in the oven for 20 minutes. Take out the biscotti, lower the oven temperature to 125 degrees C/260 degrees F (100 degrees C/210 degrees F if you’re using a convection oven) and cut them into thin biscuits and place them flat side down on the greaseproof paper and bake again for 20 minutes or until they are dried out and crisp. This entry was posted in Biscuits and tagged biscotti, biscuits, chocolate, pistachio, pistachio biscotti, pistachio chocolate biscotti. Bookmark the permalink.